a reputation as a buyer and seller. Joy O'Meara is an established antiques dealer in South Oxfordshire. 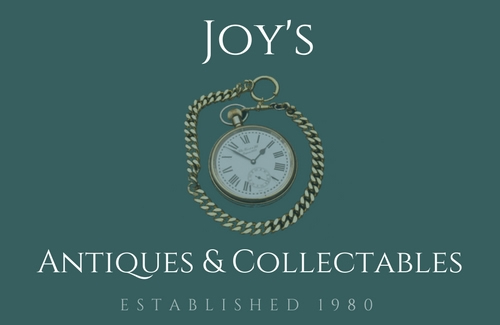 I have been successfully running Jay Fairs, Antiques and Collectables fairs, in Oxfordshire and Berkshire for nearly 40 years. I am always keen to buy items of interest and am very happy to visit you at your home, or you can visit me! I am very honest and fair and have a wide circle of clients who have sold many items of interest to me over the years. Joy has visited me at my home a number of times over the years. I have always been impressed by her knowledge of antiques and her professionalism. She is extremely personable, frank and reliable and I have great confidence in her fair dealing and transparent approach. I would not hesitate to recommend her to others. Joy is very interested in buying items in these areas in particular. Joy was a great help in guiding me regarding a number of items that I have been meaning to sell for years! I appreciated her honesty and obvious experience. She left me with a very clear picture of what I had, its value and what she was interested in buying from me. There was no pressure and I was delighted with the outcome. Joy was a pleasure to deal with and I would certainly go back to her again.